Sorry for the extra long name for this recipe! I call them my rose and cardamom ladoos (pg 93 in East by West) but since I'm too lazy to roll ladoos (Ayurvedic recipe of toasted flour, spices, jaggery and sometimes nuts and seeds which are the original energy or bliss balls) I end up setting them in a tray and cutting into squares or diamonds. 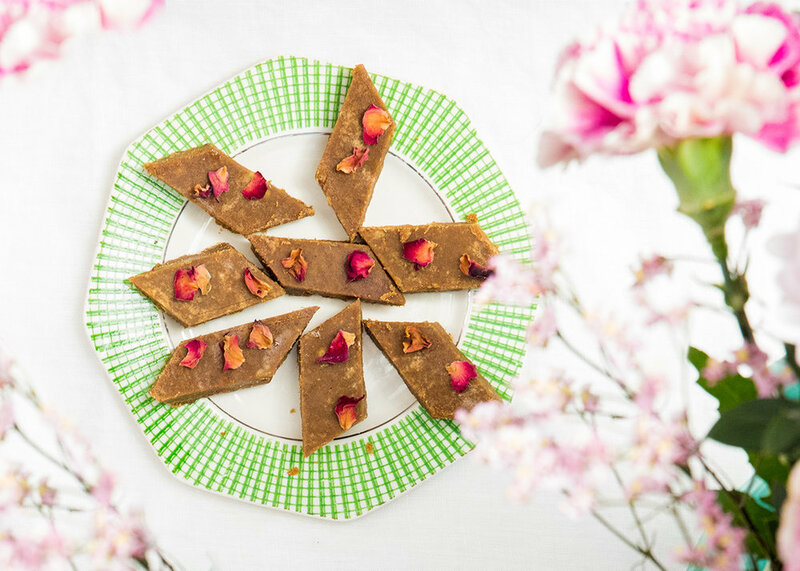 This particular recipe for anyone allergic to nuts or just wants a break from nut and seed laden snacks - the nutty flavour comes only from the toasted chickpea flour known as gram flour or besan - easily available from supermarkets. Gram flour is cheap and when toasted offers a significant source of easy-to-digest, high-quality protein, which is especially revered in Ayurveda for children and breastfeeding mothers and for those on the go all the time. Enjoy these fragrant bites. In a heavy-bottomed frying pan, dry roast the gram flour for about 15 minutes over a medium heat, stirring frequently to ensure even roasting and to keep the flour from burning. At the end of this process, the mixture should be fragrant and a few shades darker. Stir in the cardamom, jaggery, ⅔ of the ghee and salt (and rose extract to taste) stirring constantly to ensure that the ghee and jaggery melts and the mixture is as lump-free as possible, add the extra ghee as required to ensure the balls hold together. Cook for 3–4 minutes, until the mixture is well combined and becomes thick and smooth. Jaggery doesn’t melt as easily, so you won’t get a thick smooth mixture, but this is fine as long as it’s well combined. Allow to cool for some time before handling or pop in sideto the fridge to speed up the process. Take a generous teaspoon of mixture and roll into balls, sprinkle with dried rose petals and push some in slightly to decorate.